The architects of today’s devices know that accidents happen in classrooms. Some of the most popular vendors of tablets and notebooks have come up with a few ways to ensure longer life for their technologies. HP's new Education Edition notebooks and tablets each have toughened construction elements. HP recently unveiled a line of rugged devices aimed at education, the HP Pro Tablet 10, HP Pro Slate 10 and HP ProBook 11, all under the brand Education Edition. The Windows 8.1-powered tablets and notebook feature a sturdier design with rubber edges that protect the screen from face-forward tumbles to the ground. HP also says the batteries on the devices are large enough to last a full school day. 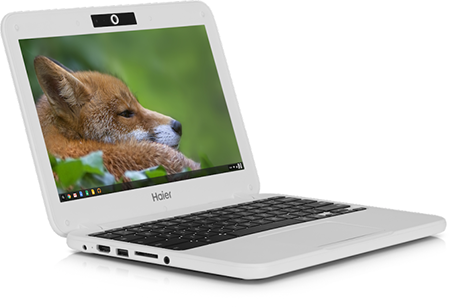 The Haier Chromebook 11e is a sturdy model built just for K–12 classrooms. A new entry to the Chromebook lineup, available later this season, is built specifically with classrooms in mind. The Haier Chromebook 11e boasts a spill-resistant keyboard that allows any liquid that hits the keyboard to go through a spill hole at the base of the device, ensuring that it doesn't stick around to muck up the machine’s inner workings. This Chromebook is "built to be abused," Rajen Sheth, the director of product management for Android and Chrome for Business and Education, told EdSurge. Another addition to the Chromebook lineup this season is sure to please educators seeking flexibility in the classroom. 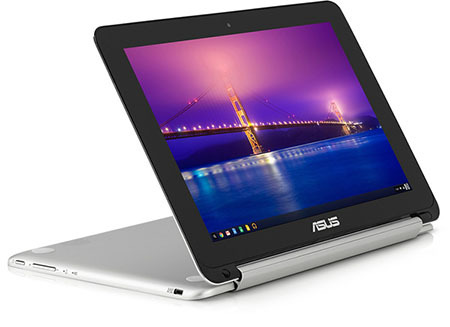 Asus' Chromebook Flip C100 is a convertible device that combines a keyboard with the versatility of a touchscreen. Similar to Lenovo's Windows 8.1-powered ThinkPad Yoga 11e, the Flip is capable of transforming from a notebook to a tablet. Though not specifically designed to be rugged, the Flip comes with a durable aluminum chassis.